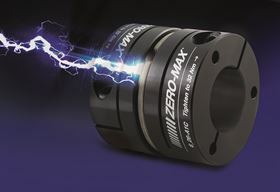 US manufacturer of power transmission components, Zero-Max, has announced that its CD couplings now feature a flex element design that adds electrical insulation protection to connected mechanical components. Designed with non-conductive composite flex elements, the CD Couplings do not pass electrical current through the coupling because the flex element provides electrical insulation. The coupling’s composite discs withstand all types of environmental elements, including temperature extremes from -40 to +70°C, as well as moisture and chemicals. The company says that disc and overall coupling design help increase the longevity and reliability of the motion system in which the coupling is used. CD couplings are available in many models and sizes, including custom designs for very high speed and dynamic applications such as high-speed packaging machinery. Standard models and sizes include single and double flex models with clamp style hubs with or without keyways. The torque capacities range from 40Nm to 1436Nm and beyond with speed ratings from 4400 RPM to 17,000 RPM. All CD couplings are environmentally friendly and are manufactured with RoHS compliant materials.